DVD Synopsis: After a boat carrying diplomats disappears on Venezuela's Orinoco River, Navy Seal Jason Fitch is called in to investigate an assumed assassination plot. But something much bigger and deadlier is the culprit: a mutant strain of giant, ferocious piranha. The first time I saw Mega Piranha, I honestly thought I was watching a comedy. I mean, it had to be, right? It was just too crazy to be taken as anything else. The camera dramatically climbs and swoops from shot to shot, even when revealing nothing more than a new character or setting, and the score is turned up to a ten on the intensity meter...all the time. 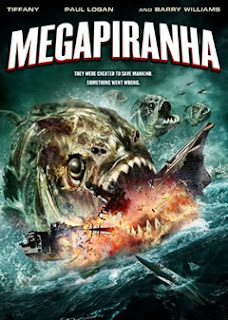 The piranha themselves are pathetically bad CGI, and the powers they've developed are beyond insane (not only do these particular piranha eat us, but they eat boats, buildings, nuclear subs, each other...oh, and they can fly, too). And who the hell talks like the people in this movie? Well, regardless of whether it was intended to be a comedy or not, this movie is damn funny all the same. So get some good friends together, break out the beer and pop Mega Piranha into the DVD player...you'll have an absolute blast with it.